The freezer is very full, but I wandered through the ice cream section anyway. 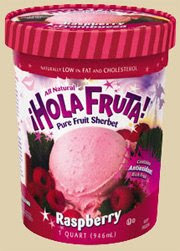 I saw a couple of sale containers I wanted to pick up, but then I spied Hola Fruta! I do get a sherbet craving now and then, and so I somehow I convinced myself to spend $5.49 for a quart of this "All Natural" sherbet. Dinner was going to take a while to cook, so I went in for the sampling. It's good! I like it. It does have a smidge of that salty flavor that hits you with some sherbets, but overall is it well made. I enjoyed it so much, I had some more after dinner as well. I like the texture too, kind of reminds me of the time when I mixed some vanilla ice cream with my cheap sherbet. It's funny, because if I had to describe it after my first serving, I'd say the aftertaste was like eating a Raspberry Tootsie Roll. On second scoop, I realized just how natural the flavor was. If you let it melt just a bit, you really are hit with that real raspberry flavor. I was really impressed at how it hits you more like fruit than as a frozen treat. If you don't mind spending a bit extra on sherbet, and you want something a bit more real, give it a try! --Nice: there website shows their sherbet with a slice of Angel food, oh I bet that's good.